We obtain exponential concentration inequalities for sub-additive functions of independent random variables under weak conditions on the increments of those functions, like the existence of exponential moments for these increments. As a consequence of these general inequalities, we obtain refinements of Talagrand's inequality for empirical processes and new bounds for randomized empirical processes. These results are obtained by further developing the entropy method introduced by Ledoux. We give an exposition of the ideas of statistical learning theory, followed by a discussion of how a reinterpretation of the insights of learning theory could potentially also benefit our understanding of a certain notion of complexity. Tsuda, K., Akaho, S., Asai, K.
Csato, L., Opper, M., Winther, O. We present an approximation technique for probabilistic data models with a large number of hidden variables, based on ideas from statistical physics. We give examples for two nontrivial applications. © 2003 Wiley Periodicals, Inc.
An Introduction to Variable and Feature Selection. We present new tools from probability theory that can be applied to the analysis of learning algorithms. These tools allow to derive new bounds on the generalization performance of learning algorithms and to propose alternative measures of the complexity of the learning task, which in turn can be used to derive new learning algorithms. Fischer, P., Buckingham, A., Beckwitt, K., Wiersma, D., Wise, F.
We report the observation of sum-frequency signals that depend linearly on an applied electrostatic field and that change sign with the handedness of an optically active solute. 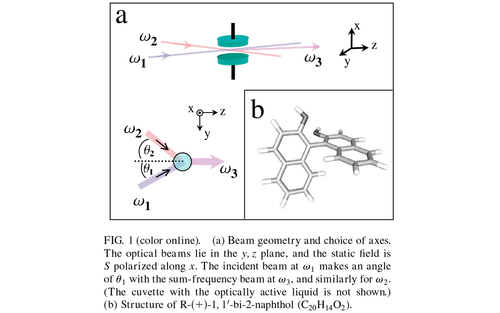 This recently predicted chiral electro-optic effect exists in the electric-dipole approximation. The static electric field gives rise to an electric-field-induced sum-frequency signal (an achiral third-order process) that interferes with the chirality-specific sum-frequency at second order. The cross-terms linear in the electrostatic field constitute the effect and may be used to determine the absolute sign of second- and third-order nonlinear-optical susceptibilities in isotropic media. Fischer, P., Wise, F., Albrecht, A. The nonlinear sum- and difference-frequency generation spectroscopies can be probes of molecular chirality in optically active systems. We present a tensorial analysis of the chirality-specific electric-dipolar sum-frequency-generation susceptibility and the achiral electric-quadrupolar and magnetic-dipolar nonlinearities at second order in isotropic media. 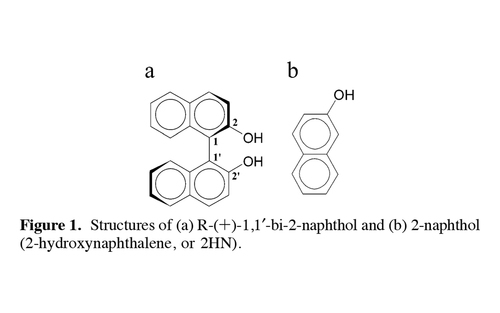 The chiral and achiral contributions to the sum-frequency signal from the bulk of optically active solutions of 1,1'-bi-2-naphthol (2,2'-dehydroxy-1,1'-binaphthyl) can be distinguished, and the former dominates. Ab initio computations reveal the dramatic resonance enhancement that the isotropic component of the electric-dipolar three-wave mixing hyperpolarizability experiences. Away from resonance its magnitude rapidly decreases, as-unlike the vector component-it is zero in the static limit. The dispersion of the first hyperpolarizability is computed by a configuration interaction singles sum-over-states approach with explicit regard to the Franck-Condon active vibrational substructure for all resonant electronic states. Sitti, M., Fearing, R. S.
Kumar, S., Chauhan, R. S., Singh, R. P., Kabiraj, D., Sahoo, P. K., Rumbolz, C., Srivastava, S. K., Bolse, W., Avasthi, D. K.
Tsai, J. L., Chin, T. S., Yao, Y. D., Melsheimer, A., Fischer, S. F., Dragon, T., Kelsch, M., Kronmüller, H.
Goll, D., Schütz, G., Kronmüller, H.
Majer, G., Stanik, E., Orimo, S.
Majer, G., Eberle, U., Kimmerle, F., Stanik, E., Orimo, S.
Barnes, R. G., Chang, C. T., Majer, G., Kaess, U.
Morán, S., Ederer, C., Fähnle, M.
Tripathi, A., Khan, S. A., Srivastava, S. K., Kumar, M., Kumar, S., Rao, S. V. S. N., Lakshmi, G. B. V. S., Siddiqui, A. M., Bajwa, N., Nagaraja, H. S., Mittal, V. K., Szökefalvi, A., Kurth, M., Pandey, A. C., Avasthi, D. K., Carstanjen, H. D.
Walz, F., Brabers, V. A. M., Brabers, J. H. V. J., Kronmüller, H.
Dürr, A. C., Schreiber, F., Kelsch, M., Carstanjen, H. D., Dosch, H., Seeck, O. H.
Denbeaux, G., Schneider, G., Pearson, A., Chao, W., Bates, B., Harteneck, B., Olynick, D., Anderson, E., Fischer, P., Juenger, M.
Ederer, C., Komelj, M., Davenport, J. W., Fähnle, M.
Komelj, M., Ederer, C., Fähnle, M.
Majer, G., Gottwald, J., Peterson, D. T., Barnes, R. G.
Ederer, C., Komelj, M., Fähnle, M.
Sitti, M., Aruk, B., Shintani, H., Hashimoto, H.
Wu, Y. C., Ye, F., Barbe, V., Sprengel, W., Reimann, K., Reichle, K. J., Goll, D., Würschum, R., Schaefer, H. E.
Zhang, H. W., Zhang, S. Y., Shen, B. G., Kronmüller, H.
Denbeaux, G., Anderson, E., Bates, B., Chao, W., Liddle, J. A., Harteneck, B., Pearson, A., Salmassi, F., Schneider, G., Fischer, P., Eimüller, T., Taylor, S., Chang, H., Kusinski, G. J.
Brader, J. M., Evans, R., Schmidt, M.
Drautz, R., Singer, R., Fähnle, M.
Becher, M., Haluska, M., Hirscher, M., Quintel, A., Skakalova, V., Dettlaff-Weglikovska, U., Chen, X., Hulman, M., Choi, Y., Roth, S., Meregalli, V., Parrinello, M., Ströbel, R., Jörissen, L., Kappes, M., Fink, J., Züttel, A., Stepanek, I., Bernier, P.
von Zeppelin, F., Haluska, M., Hirscher, M.
Yamakawa, K., Ege, M., Ludescher, B., Hirscher, M.
Artru, X., Baier, V., Beloborodov, K., Bochek, G., Bogdanov, A., Bozhenok, A., Bukin, A., Burdin, S., Chehab, R., Chevallier, M., Cizeron, R., Dauvergne, D., Dimova, T., Drozdetsky, A., Druzhinin, V., Dubrovin, M., Gatignon, L., Golubev, V., Jejcic, A., Keppler, P., Kirsch, R., Kulibaba, V., Lautesse, P., Major, J., Maslov, N., Poizat, J. C., Potylitsin, A., Remillieux, J., Serednyakov, S., Shary, V., Strakhovenko, V., Sylvia, C., Vnukov, I.
Albrecht, J., Leonhardt, S., Spolenak, R., Täffner, U., Habermeier, H. U., Schütz, G.
Schaal, S., Ijspeert, A., Billard, A. Movement imitation requires a complex set of mechanisms that map an observed movement of a teacher onto one's own movement apparatus. Relevant problems include movement recognition, pose estimation, pose tracking, body correspondence, coordinate transformation from external to egocentric space, matching of observed against previously learned movement, resolution of redundant degrees-of-freedom that are unconstrained by the observation, suitable movement representations for imitation, modularization of motor control, etc. All of these topics by themselves are active research problems in computational and neurobiological sciences, such that their combination into a complete imitation system remains a daunting undertaking - indeed, one could argue that we need to understand the complete perception-action loop. As a strategy to untangle the complexity of imitation, this paper will examine imitation purely from a computational point of view, i.e. we will review statistical and mathematical approaches that have been suggested for tackling parts of the imitation problem, and discuss their merits, disadvantages and underlying principles. Given the focus on action recognition of other contributions in this special issue, this paper will primarily emphasize the motor side of imitation, assuming that a perceptual system has already identified important features of a demonstrated movement and created their corresponding spatial information. Based on the formalization of motor control in terms of control policies and their associated performance criteria, useful taxonomies of imitation learning can be generated that clarify different approaches and future research directions. Campolo, D., Sitti, M., Fearing, R. S.
Im, M. Y., Fischer, P., Eimüller, T., Denbeaux, G., Shin, S. C.
Eimüller, T., Niemann, B., Guttmann, P., Fischer, P., Englisch, U., Vatter, R., Wolter, C., Seiffert, S., Schmahl, G., Schütz, G.
Drautz, R., Schultz, I., Lechermann, F., Fähnle, M.
Fischer, P., Denbeaux, G., Stoll, H., Puzic, A., Raabe, J., Nolting, F., Eimüller, T., Schütz, G.